Champion, right, and reserve suffolk with father and son Melvin, right, and Murray Stuart. Flockmasters from near and far descended on the Thainstone Centre, Inverurie, for the two-day event organised by Aberdeen & Northern Marts in conjunction with the Aberdeen Fatstock Association. Leading the sale at 3,500gn was a Texel gimmer from Graham Morrison’s Deveronvale flock at Inchbruich Farm, near Cornhill, Banff. By Knap Yard Master, and in-lamb to Deveronvale Aftershock, she sold to the Alexander family’s Breddie’s flock at Auchenbreddie, Insch. Next best at 3,000gn was a Texel gimmer from the Hunters at West Cairnhill, Culsalmond, Insch. By Knap Yard Master, and in-lamb to Craig Douglas Blackjack, she stood reserve champion at the Fettercairn Show in July. The buyer was S Ferris, 4 Lea Poges Road, Dromore, Northern Ireland. Thereafter both the overall and reserve Texel champions sold for 2,000gn. First at this price was the reserve – a gimmer by the £60,000 Strathbogie Yes Sir and in-lamb to triplets by Auldhouseburn Billy The Kid – from Robbie Wilson’s Milnbank flock at North Dorlaithers Farm, Turriff. She sold to Douglas Webster, Lower Reiss, Wick. The champion – a gimmer by the 32,000gn Arkle Yingyang and in-lamb to Garngour Alabama – came from Kenny Pratt’s Hilltop flock at Oldtown Farm, Peterculter. She sold to J Foster, 24 Foresters Road, Castlederg, Co Tyrone. 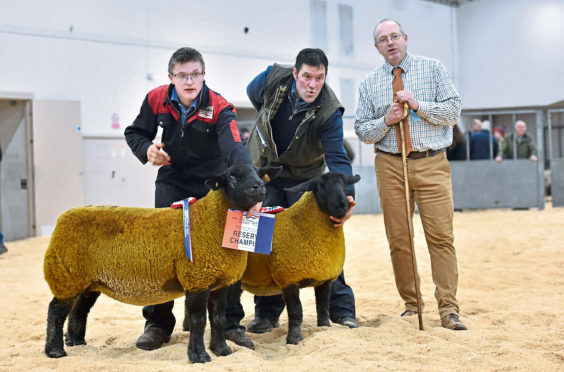 Meanwhile, Suffolks sold to a top of 2,400gn for the champion – a ewe lamb, by Limestone Legend, from George and Melvin Stuart’s Birness flock at Milltown of Birness, Ellon. She sold to LM MacAullay, 3 Easter Coxton, Elgin. Birness enjoyed further success selling another ewe lamb by Limestone Legacy for 2,100gn to Finn Christie, Newton of Balquhain, Pitcaple, Inverurie. The flock also achieved 2,000gn selling a gimmer by Limestone Legend, in-lamb to Limestone Legacy, to R McLaughlin, Malin Stables, Malin Town, County Donegal. The Suffolk reserve champion, also from Birness, sold for 1,100gn to R McLaughlin. This was a gimmer by Redbrae Rambo, in-lamb to Ballycannon Noah. Another gimmer with the same breeding, this time from Craig Paterson’s Cranorskie flock at Cranna Bridge, Aberchirder, also sold to R McLaughlin. Another Suffolk at 1,600gn was a gimmer, by Cavangrove Catalyst and in-lamb to Limepark Touch the Stars, from Jimmy Douglas’ Cairness flock at Woodhead of Cairness, Fraserburgh. She sold to John Gibb for his Cairnton flock at Techmuiry, Fraserburgh. In the Beltex section a top price of 2,300gn was paid for the champion – a gimmer named Woodies Cobwebb, by Woodies Thug and in-lamb to Aviemore Casinova, from Stuart Wood, Woolhillock, Skene. She sold to the judge – Gordon Carroll, Edendiack, Gartly, Huntly. He also paid 1,000gn for the reserve champion – a gimmer named Aviemore Carol, by Corstane Whistler and in-lamb to Kingledores Destroyer, from the Mairs at Muirfield, Everton of Auchry, Cuminestown. Lastly, the Charollais section topped at 320gn for a gimmer from the Duncan sisters at Barnyards, Clola, Mintlaw. By Logie Durno Outlander, and in-lamb to Logie Durno Sargeant, she sold to Morgan Robert, Swarhoull, Wester Skeld, Shetland. Blue Texels topped at 1,000gn for a gimmer, by Dulas Axe and in-lamb to Sams Chancer, from the Hunters at West Ciarnhill, selling to Anside, Braehead, Drummuir, Keith. The averages were: Beltex ewe lamb, six, £161.66; Berrichon ewe lamb, five, £100; Suffolk ewe lamb, seven, £1,178.57; Texel ewe lamb, six, £291.66; Beltex ewe, one, £680; Blue Texel ewe, one, £420; Charollais ewe, two, £240; Suffolk ewe, nine, £411.11; Beltex gimmer, 17, £548.82; Blue Texel gimmer, six, £790; Charollais gimmer, two, £310; Suffolk gimmer, 32, £697.50; and Texel gimmer, 60, £671.50.